Around Town: Outside Mullingar, Sister Helen Prejean, Eyes of Agape . . .
Ron Reed (left), John Emmet Tracy, Rebecca deBoer and Erla Faye Forsyth in Outside Mullingar. Photo by Matt Reznek. 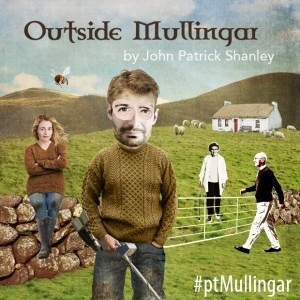 Pacific Theatre will be creating a little corner of Ireland over the next month, in their production of Outside Mullingar. But it took playwright John Patrick Shanley many decades to warm to such an undertaking. He said in a 2014 New York Times article: “I never wanted to write about the Irish.” Sure, he was Irish-American, but during 30 years of writing he rigorously avoided his heritage. I always knew I’d have to come home eventually. I’m Irish as hell: Kelly on one side, Shanley on the other. My father had been born on a farm in the Irish Midlands. He and his brothers had been shepherds there, cattle and sheep, back in the early 1920s. I grew up surrounded by brogues and Irish music, but stayed away from the old country till I was over 40. I just couldn’t own being Irish. 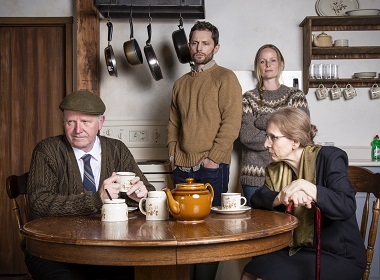 Besides [being a] love story, the play is also about its setting, rural Ireland and family. “Even if we aren’t Irish, or from a farm, there’s a feeling of coming home that the play evokes,” Konrad said. As part of her research, Konrad visited Ireland, specifically the county of Westmeath, where the play is set. Rosemary and Anthony are a pair of introverted misfits whose families have lived on neighbouring farms as far back as anyone can remember, battling over property lines and childhood stories but never what matters most. A quirky story of flawed love and some kind of happiness told with effortless wit and poetic Irish lyricism. Go to Soul Food Vancouver for more background on Shanley and his play, which runs May 19 – June 10. Sister Helen Prejean was in Vancouver for the Dead Man Walking opera late last month. I try to keep up with significant events in the city, but I really missed a good one late last month. 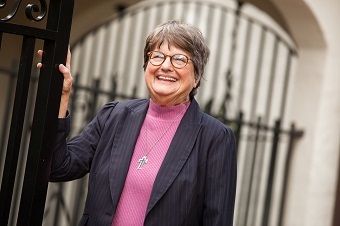 The renowned Sister Helen Prejean (leading advocate for the abolition of the death penalty, whose work was featured in the movie Dead Man Walking) was in Vancouver for the opening of . . . Dead Man Walking (the opera). She was here to watch the Vancouver Opera perform her story and to speak on a social justice panel. The B.C. Catholic: How does a religious education teacher start visiting inmates on death row? Sister Helen Prejean: I was in my 40s. I had grown up in a privileged life. I became a nun. I was prayerful. I was the director of religious education in a parish, but I was always in the suburbs. We had 10 major housing projects where African-American people were suffering terribly (but) I was oblivious. Well, you can make those kinds of arguments when your family is not suffering, you’re not suffering, you have health care, you have education and you have everything you need. I was sincere, but I was not awake. The awakening happened when we were at a conference and a nun – Sister Marie Augusta Neal – was giving a talk and it was about being women of social justice. I’d been on the other side of the debate, the “spiritual” camp. We’re nuns. We’re not social workers. Then here comes this social justice nun. On the second day, she was talking about Jesus. She said integral to the Good News Jesus preached to poor people is that they would be poor no longer. It’s not God’s will for them to be poor and to suffer. Everything changed then. It was like tectonic plates, everything shifted. I thought: “I don’t even know any poor people.” I woke up and moved into the St. Thomas housing projects. African-American people became my teachers then. One day I came out of that adult learning centre called Hope House and somebody asked me: “Would you like to write someone on death row?” I didn’t know anything about prisons! Go here for the full interview; it’s well worth reading. Inspired by the story of Hagar in Genesis, Grace W.S. Tan captures the creative and compassionate nature of “The God who sees” as she portrays a myriad of characters in figurative charcoal drawings. Grace was born in Hong Kong and spent her formative years in England. She received her Art education partly in London and Toronto. 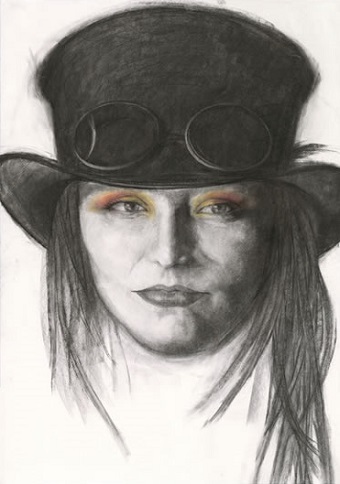 For some 30 years after graduating from Ontario College of Art in Graphic Design and earning a Bachelor of Arts from University of Guelph, Grace did not engage in any artistic activities but devoted her time to the care of home and family. The exhibition runs until June 22. Carl Armerding (left), Jeffrey Greenman and Ward Gasque – key players in the Regent College story. 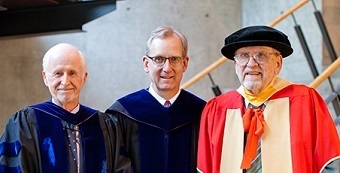 Regent College announced the appointment of two new professors emeriti during the 47th Convocation of Regent College at the Chan Centre April 28. Regent president Jeffrey Greenman remembered the “manifold contributions” of Carl Armerding and Ward Gasque to the college. “Along the way,” said Greenman, “they’ve held various senior leadership roles at Regent: Carl served as principal-president between 1978-88, and Ward served as vice principal.” Go here for Greenman’s comments. Roy Bell, former senior pastor at First Baptist in Vancouver and principal of Carey Theological College, passed away May 11 in Duncan, two days after his wife Elizabeth and he marked their 65th wedding anniversary. Roy is the father of the Canadian Baptist of Western Canada executive minister, Jeremy Bell. The funeral service will take place May 28, 3 pm, at First Baptist Church. Another leading figure in the Metro Vancouver area passed away recently. Arne Bryant, a Surrey resident who founded Prayer Canada, died May 14 at the age of 99. Beth Carson wrote his biography in 2014. There will be a celebration of his life at Calvary Worship Centre in Surrey May 20, 2 pm.